Annette Cortés Arcelay is a Limited Member of the Firm and member of the Litigation and Trial Practice Department of Goldman Antonetti & Córdova, LLC. 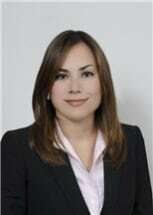 Ms. Cortés Arcelay has experience litigating at both trial and appellate court levels. She concentrates on complex civil and commercial litigation, distributorship, franchising and representation related suits and disputes, government procurement processes and contracts, construction defects claims and facilities related disputes, civil rights, and administrative and appeal proceedings.